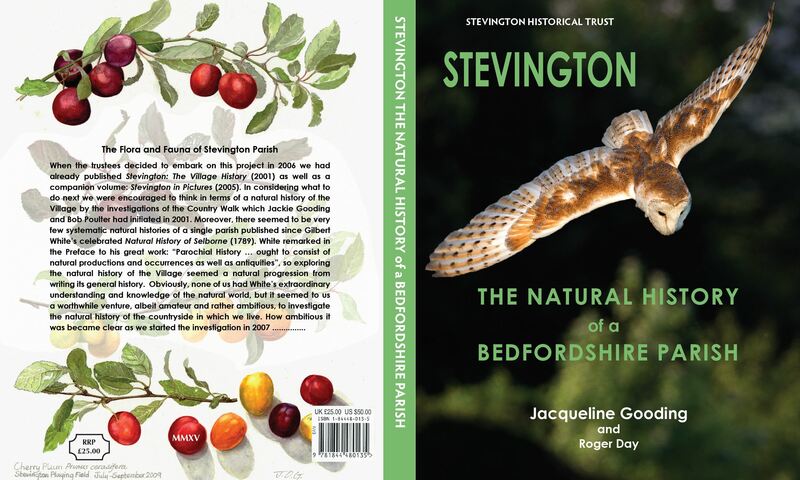 Later this year the Trust will publish its latest work entitled: “Stevington – The Natural History of a Bedfordshire Parish.” We are now taking advance subscriptions. The book, which is lavishly illustrated with photographs by Roger Day and drawings and paintings by Jackie Gooding, will be published in November. All the illustrations are of flora and fauna photographed in the Village or drawn from specimens found in the Parish. We expect the book to run to about 350 pages, 300mm x 240mm in size and printed on 130gsm silk paper with a hard cover. The initial print run is to be 350 copies and all books will be numbered. Numbered books will be allocated on a first come first served basis. Until 30 June 2015 the price will be £25.00 for orders received on or before that date. Thereafter the price will be £27.50. Anyone who purchases a copy before that date will be recorded in the book as a subscriber and will receive an invitation to the launch of the book to be held in St Mary’s Church on Saturday 14 November 2015. Please note: The price does not include postage. Copies can be collected at the launch or posted on request for an additional cost of £6.50 within the UK. For shipping overseas or multiple copies please ask for a quotation. Please phone or email (peter2hart@btinternet.com) to confirm when you have paid.